Ah Architecture – visual art at best and the ultimate yearning for timelessness. Architecture can give one a real sense of the place you are in as we might shape our buildings but our buildings shape us. 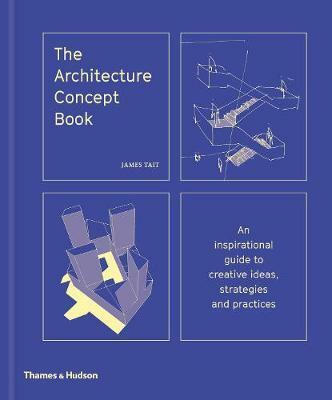 The Architecture Concept Book is an integral resource book for students ingrained in the subject matter as well as those tangentially interested in what creates the foundation of our day-to-day. The approach of the book is focused on established and underlying theories but has its focus firmly set on how to tackle the challenges the 21st century presents – a globalised, homogenous world that is getting more complex by the minute with new technologies emerging constantly. A merit of the book is that it is not meant to provide a mere guideline but a source of inspiration and stimulation. An impulse to think outside the box, break outside the confines of conservatism and to be open for everything that is going on around you. The Concept Book is organized in a thematic manner covering wide-ranging topics and 35 topics that are certainly not part of your run-of-the-mill architectural studies. What the author James Trait accomplished with the help of 350 illustrations is not only adhering to themes intrinsically linked to architecture, but to explore concepts like acquaintanceship, dominance and powers of recall through elaborations about purely architectural components, social phenomena and what the potential architecture intrinsically has. Richly illustrated with plans and photographs, spatial ideas are unpacked and presented in an enjoyable and easy to comprehend manner.